This past weekend was a bit of a baking marathon. My kitchen now permanently smells like butter and sugar. Not that I am complaining. One of the many baking projects I took on this weekend was making cupcakes for a bridal shower. I tend to have these grandiose ideas when anyone asks me to make something for them. I try to come up with some unique and delicious flavors. But when push comes to shove, I always seem to fall back on some old classics. There is nothing wrong with a classic chocolate cupcake. In fact, sometimes a classic chocolate cupcake is the best cupcake. 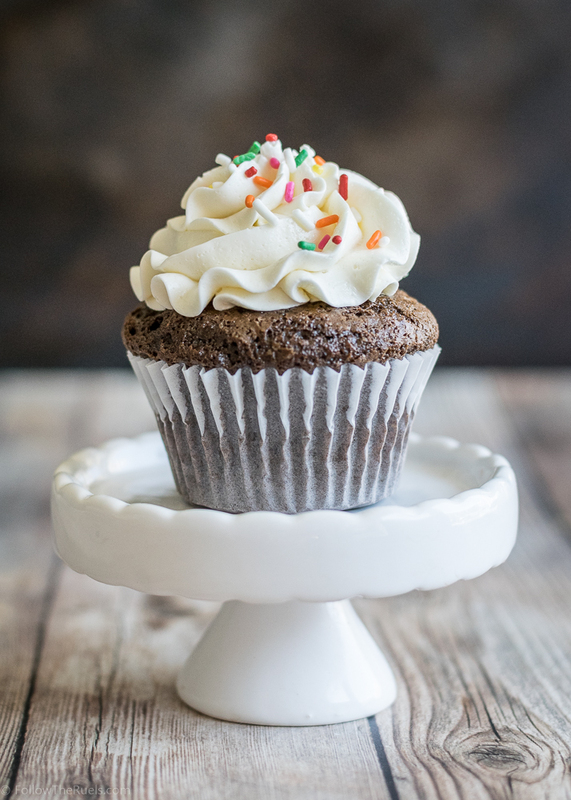 This particular chocolate cupcake recipe is one of my favorites because, well, it's just dang delicious! But maybe more importantly it only dirties up one bowl! After baking dozens of cookies and cupcakes all weekend, trust me, that really is the most important thing about this recipe. The ingredients are pretty standard, but I always recommend to use the best possible cocoa powder whenever possible, because that is what will effect the flavor the most. I have made this exact same recipe with cheaper cocoa powder, and the cupcakes don't have the same richness and flavor. My favorite cocoa powders are Ghirardelli, which you can get in most super markets, or Valrhona, which may be a bit harder to find in stores but can easily be found online. Since this is one bowl recipe, start by dumping all the dry ingredients into a big bowl - flour, cocoa powder, sugar, baking powder, baking soda, and salt. Then give it a good stir to get everything mixed together. Then mix in the wet ingredients. I like to measure my milk, then pour the oil right into the same measuring cup, only dirtying one measuring cup. Since this recipe calls for 3/4 cup milk and 1/4 cup oil, you should have 1 cup in the end. Also, this is a tip I picked up from a baking class and many Food Network shows, it's best to mix the batter as little as possible. It should just be mixed until the flour is just barely incorporated. Too much mixing and the cake will be dense and tough. All that to say, it's okay if your batter has a couple lumps. It doesn't need to be perfectly smooth. Next, fill the muffin tin up with batter. I try to fill mine up about 2/3rds of the way, but I haven't quite mastered that yet. Some of my cupcakes come out too small, while others have these little muffin tops. Again, I am not complaining. 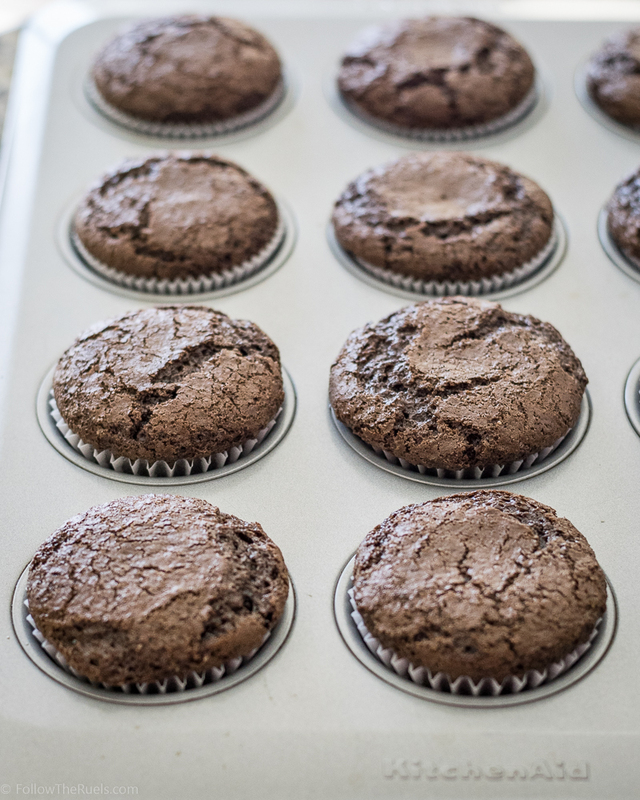 Muffin tops are my favorite (except on me), but would be nice to have more uniform cupcakes. After a few minutes in the oven, they are good to go! They will make your kitchen smell amazing. You may even risk burning your tongue just to bite into one right away. Something I know nothing about...[as she looks around nervously]. The only thing easier that these cupcakes is a cupcake mix out of a box, and trust me, these taste ten times better! Preheat oven to 350 degrees and line a muffin tin with muffin tin liners. In a large bowl, whisk together the flour, cocoa powder, sugar, baking soda, baking powder, and salt. Pour in milk, oil, eggs, and extracts. Mix until the flour is just barely combined, just until that last dry bit of flour has been incorporated. Pour about 3 tbsp of batter into each muffin tin so that they are 2/3rds of the way full. Bake for 18-20 minutes, or until a toothpick comes out almost clean. Its okay if there are a couple crumbs on it. Let cool on a cooling rack for at least 15 minutes before frosting.